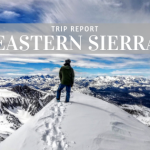 This review comes from 14,000′ Camp on Denali, where TMS gear tester Brad Miller took time out of his epic two week summit trip of North America’s tallest mountain to review Goal Zero’s solar panel portable power technology. 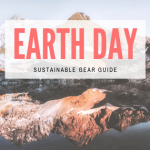 Over my ten years of backpacking and traveling I have used a number of portable solar power chargers and none of them lived up to their claims – until I discovered Goal Zero. 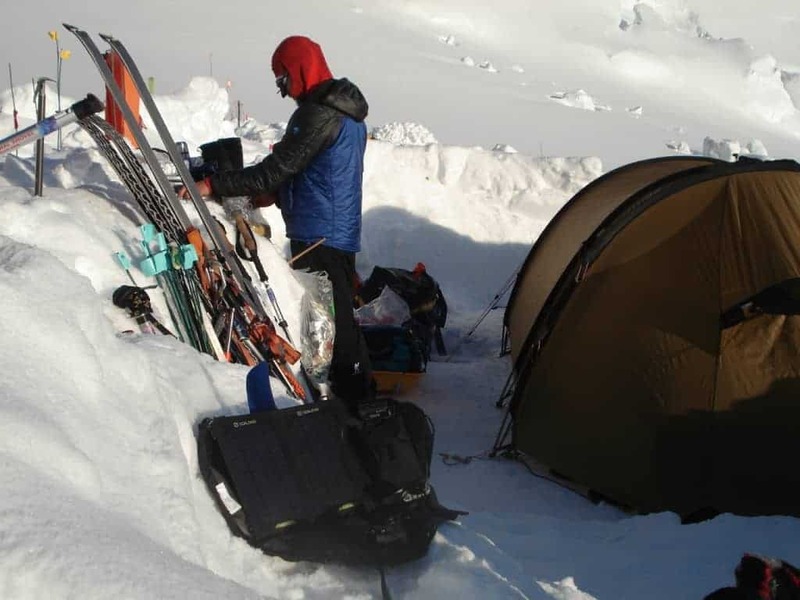 In May 2012 I took a Goal Zero Zero Nomad 7 Guide 10 to Denali where I used the entire setup for two weeks up to 14,000 feet, and the Guide 10 battery pack up to 17,000 feet, all with great success. 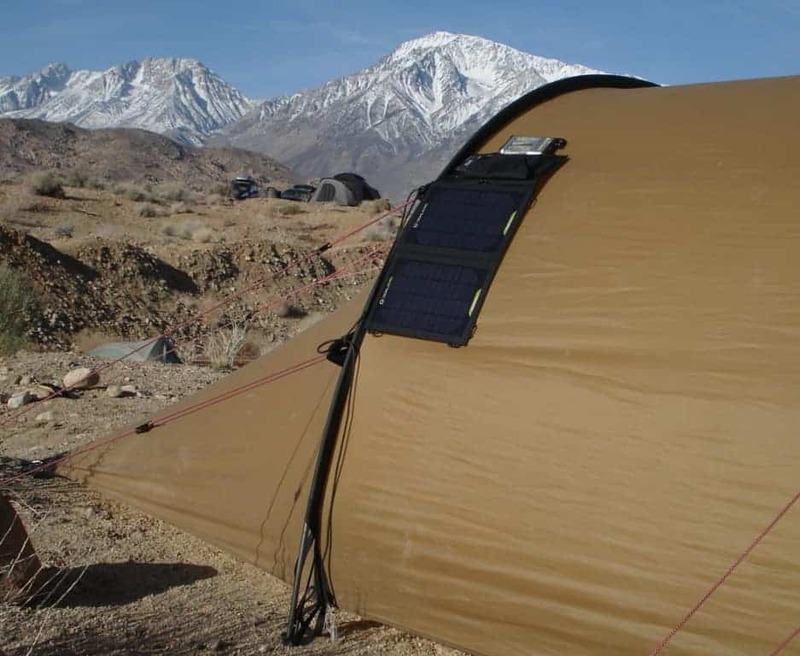 Goal Zero makes a wide range of portable solar arrays that cover everything from the small and light with little power output to the large and heavy that cover large RV situations. Each model has a number in its name which corresponds to the unit’s wattage. The higher the wattage, the more solar cell surface and power output, meaning more storage and less charging time but also a correspondingly larger and heavier array. 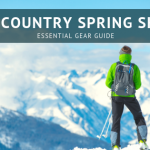 With so many options there is likely one that will work for whatever activity you are planning unless, you are going ultra-light, in which case a solar array is probably not on your packing list anyway. For our expedition we chose the Nomad 7 due to its good balance between weight and power. Although it is over twice as heavy as other small chargers I have used, like the Solio Classic, we found that the weight penalty was worth having an array that actually did what it promised. Having two larger 6 x 9-inch panels and an output of seven watts in full sun means you can charge a fully spent Ipod in 3.5-4 hours. Other brands claim to charge the same devices in 9 hours, but in my experience, take closer to all day, to charge 90-100%. The Goal Zero arrays are also much more versatile than other systems. The folding configuration protects the panels and keeps its packed footprint to a minimum. With three different charging options (12v, USB and battery pack) the Nomad 7 allows you to charge multiple devices at once and comes with an adaptor to accept any car charger you already own. These units can also be chained together, so if you have a buddy with an array, theirs can be combined to greatly increase your power output. With its numerous daisy chain points the Nomad is easy to tie to tents and packs. Adding the Guide 10 power pack further increases the array’s versatility. The Guide 10 portion of the array refers to a separate plastic unit that accepts four rechargeable AA (included, worth about 10 dollars) or four AAA batteries with an adapter that is sold separately. Taking the power pack out of the array and creating a separate unit accomplishes something brilliant. Without an internal battery, you don’t have a proprietary expensive part to replace once it has expired. Your power storage is only limited by the amount of batteries you want to carry, including the option to ditch storage all together if you want to lighten your load. Furthermore, you can charge AA or AAA batteries for devices that require them (think camera and GPS). This is not possible with most arrays that have internal storage. When you require power but don’t want to pack the panels you can charge just the battery pack, which will give you approximately 2.5 full charges of an Ipod. This is great for week-long trips or stints at high camps where weight is a premium factor. 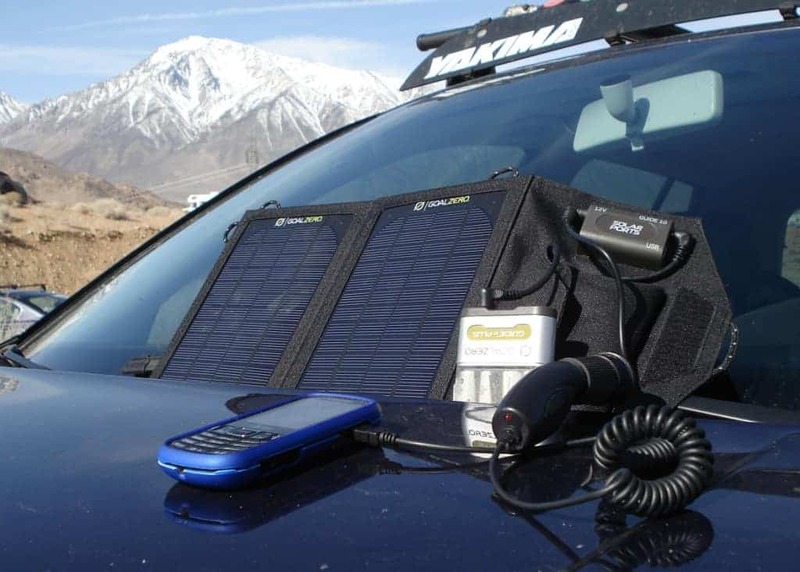 You can also use a computer or wall outlet (USB to mini-USB, or AC to mini-USB) to charge the pack, which means it has a dual function as a solar power pack and a wall charger for all the AA and AAA’s you carry during urban travels. As for durability, Goal Zero products rank very high. The company rigorously tests the products in all environments, from freezing temps to water submersion. The panels are considered water resistant but tests show that they are essentially water proof. In short, you will be hard pressed to break a Goal Zero array. We do have a few criticisms about the unit, but none of which are deal breakers. The Nomad 7 will charge a smart phone but gets a little cranky when doing it. Charging the devices works well until someone walks in front of the panel or a large cloud rolls through. Sometimes when solar input is disturbed in this way the unit’s charge will be interrupted and you will have to disconnect and reconnect the device to restart the charge. We also found that it is sometimes hard to start a charge on a completely dead Ipod. This may be the result of the charging system not recognizing a device was hooked up because the battery was so low. It was, however, very cold, and after warming my Ipod in a chest pocket for 15 minutes the unit recognized it. I have not reproduced this condition in warm temps but I think it is good practice to not run your devices down to zero battery – just in case. You can feel confident buying from Goal Zero. The company was born from a nonprofit called TIFIE Humanitarian, which stands for “Teaching Individuals and Families Independence through Enterprise”. They help individuals start self-sustaining businesses in impoverished regions. A portion of the proceeds from Goal Zero go to support its nonprofit branch.